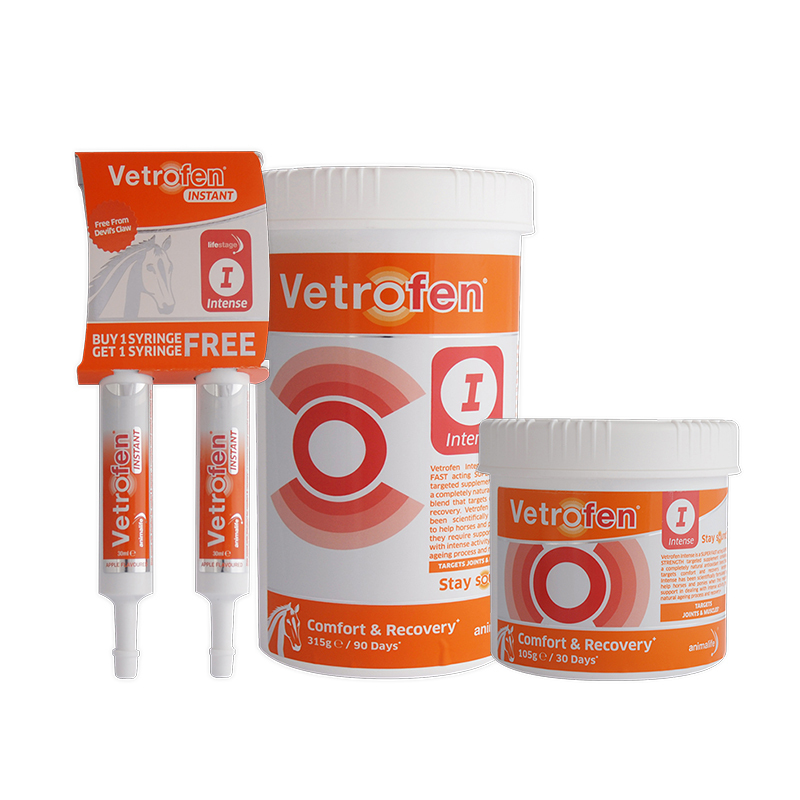 Vetrofen Intense is a unique joint supplement by animalife, that's been scientifically developed to relieve joint pain & improve your horse's comfort levels. It contains Scutellaria baicalensis & Acacia catechu, which have been proven to reduce symptoms of arthritis. Vetrofen Intense stands out as a market leading joint supplement, as it contains Scutellaria baicalensis & Acacia catechu. These ingredients have been used for years in joint supplements for human medication, but are not yet included in many equine joint supplements. Studies in animals with arthritis, have shown that when these two ingredients are used in combination, they reduce joint pain & swelling. Vetrofen Intense is ideal for active or competition horses who need to be comfortable & flexible to be performing at their best. It's also ideal for the older horse to keep them mobile & improve their quality of life. Most owners start to notice a difference in their horse's flexibility in only 4-5 days & nearly all have noticed a difference after 10-15 days of feeding Vetrofen Intense. To get an even quicker response, use Vetrofen Intense Instant Syringes. Give one syringe the night before a competition & one syringe 2-3 hours before the competition. Feeding Instructions- Feed a "Loading" rate for the first 10 days, followed by an "Intense" rate, then "Maintenance" rate. If possible, split the daily amount between morning & evening feeds. Warning- Do not use Vetrofen Intense at the same time as Bute (phenylbutazone), or any other NSAID drugs (eg. Metacam, Danilon).